Following are the cricketers, team, and umpire who have won ICC Awards in the ICC Awards ceremony 2011 annual ceremony held in London. Jonathon Trott (England)- In 12 Tests during the period under consideration, Trott scored 1042 runs at an average of 65.12, including four centuries and three half-centuries. In addition, he played 24 ODIs, with1064 runs at an average of 48.36 with two centuries and nine 50s. Trott was chosen for the award ahead of England opener Alastair Cook, last-year's winner Sachin Tendulkar and South Africa batsman Hashim Amla. Alastair Cook (England)- During the performance period, Cook played 12 Tests and in 18 innings he scored 1302 runs at an average of 51.74, including six centuries and four half-centuries. His 235 not out against Australia in Brisbane kick-started England's first Ashes victory away from home since 1986-87. Cook finished the Ashes with a phenomenal tally of 766 runs, but his best batting effort came against India at Edgbaston, where his monumental 294 helped England seal the series and knock India off the No. 1 Test spot. Kumar Sangakkara (Sri Lanka)- Sangakkara played 25 ODIs in the period under consideration - August 11, 2010 to August 3, 2011 - and scored 1049 runs at an average of 55.21 including a century and seven half-centuries. He also had 26 catches and 10 stumpings as wicketkeeper and led Sri Lanka to the final of the 2011 World Cup. Tim Southee (New Zealand) - Southee ripped the heart out of Pakistan's batting line-up in Auckland, after they had cruised to an imposing 58 for 1 in 5.5 overs. Southee then struck five times in nine balls, including a hat-trick that accounted for Younis Khan, Mohammad Hafeez and Umar Akmal, to put his side on course for a win. Southee's effort was adjudged the best in the voting period, from August 11, 2010 to August 3, 2011. It was chosen ahead of Tim Bresnan's 4 for 3 against Pakistan in Cardiff in September 2010, JP Duminy's 96 not out off 54 balls against Zimbabwe in Kimberley in October 2010 and Shane Watson's 59 runs off 31 balls against England in Adelaide in January 2011. Aleem Dar (Pakistan)- Dar has officiated in five Tests and 13 ODIs during the voting period, including the World Cup final between India and Sri Lanka.This also included successful UDRS referrals which ultimately turned to Dar's favour during the World Cup. He was voted to the award by the 10 Full Member captains as well as the eight-man elite panel of match referees. 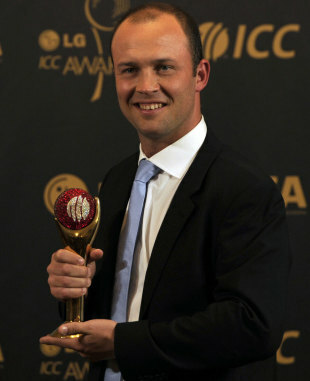 He accepted his award from ICC Hall of Fame 2011 inductee Alan Davidson. MS Dhoni (India)- The Indian captain, has won the ICC Spirit of Cricket Award for his decision to recall Ian Bell after his controversial run-out during the Trent Bridge Test. 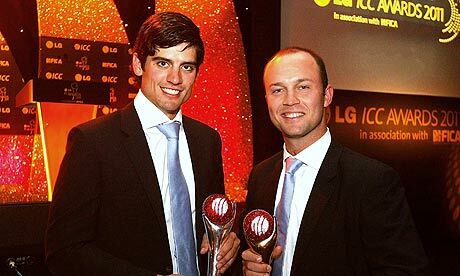 Dhoni was unavailable to collect his award, though the Indian team was present in England.